Eighteen months ago a relationship blossomed between the First Presbyterian Church of Reading and Spotts, Stevens and McCoy (SSM). The result was a mutually advantageous sale of the firm’s Wyomissing facility allowing First Presbyterian to build a suburban presence, and SSM to reinvest resources into growing the business and addressing facility needs for a diverse and mobile staff. An expanded geographic footprint in the Southeastern and Central PA, Lehigh Valley communities where SSM serves a growing client base and implementation of workplace strategies that encourage flexible work arrangements, mobility, and integration of technology are just a few of the results from the sale of the building. SSM recently completed the reconfiguration of our headquarters office at 1047 North Park Road and is hosting a Ribbon Cutting Ceremony on September 26, 2018 from 12:00 pm to 2:00 pm to commemorate the newly-renovated office space and entranceway. Brian R. Kelly, President and CEO, will be leading the ceremony at 12:30 pm. Lunch and refreshments will be served featuring locally-known Berks Hot Dogs as well as a build-your-own sundae bar for dessert by the Sweet Ride ice cream truck. The new SSM Lancaster Regional Office opened August 1, 2018 and is located in the Newport Commons community at 701 Creekside Lane in Lititz, PA. This office will also house dedicated and mobile staff to serve a growing base of Central PA clients. 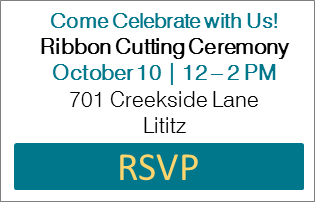 To celebrate the grand opening of the new office, SSM will be hosting a Ribbon Cutting Ceremony from 12:00 pm to 2:00 pm on October 10, 2018. In addition, on October 1st a new, larger office at the Roma Corporate Center in Allentown will allow the firm to house a growing staff to serve Lehigh Valley.